The 10 reasons to visit Lublin mentioned below have been selected by Martin’s City Tours purely based on our own experiences. They are published in random order. Lublin has a long and rich Jewish history. It has even earned the name of Jewish Oxford. Famous rabbis, like the Seer of Lublin were living and teaching in the Jewish Quarter. The Jews started to develop a community in Lublin during the 1500’s. Most of them bought plots around the Castle. Until WWII, a big Jewish neighborhood was in place there. Unfortunately, almost all Jewish residents were murdered by the Nazi regime. The Jewish Quarter was purposely destroyed during the years of the Nazi occupation. Let me quote some figures to give you an idea about the impact WWII had on the Jews in Lublin: in 1939 42,830 Jews were living in Lublin, a third of the total Lublin population. Only 200 Lublin Jews survived the war. Artifacts of the horrors of the holocaust are preserved in today’s Lublin. The former Nazi concentration camp Majdanek is now open for the public. It functions as a memorial and museum. A visit to Majdanek helps you understand what the daily life in a concentration camp looked like and what suffering the prisoners had to endure. The former office of the Sicherheitspolizei is nowadays open for the public, too. In the Martyr Museum “Under the Clock“, you can see an exhibition depicting the brutal punishments and torture the Jewish and other nationalities underwent during WWII. Thankfully, there are also brighter reminders of the Jewish culture still available nowadays. Restaurant Mandragora does not only serve Jewish cuisine but it also offers you an insight in the Jewish life before 1939. Their bakery sells lovely fresh bread and delicious cakes. Hotel Ilan is located in the former Yeshiva dated back to 1930. The building survived WWII because the Nazis opened a hospital there. 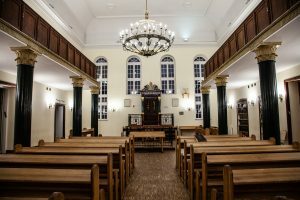 Lublin synagogue is located in the ground floor. Shabbat and Jewish holidays are celebrated there but it is also open for the public. 10 Reasons to visit Lublin – Martin’s City Tours insider tip: The Olive Restaurant (part of Hotel Ilan) is the only restaurant in Lublin offering high quality certified kosher meals. Important to know: please, make a reservation for your kosher food. You can easily call Lublin the City of Festivals. The city hosts more than 40 recurring festivals & events a year and a high number of one-off events all year around. From a Jazz to a fantasy & science fiction festival, you name it – we host it! Four of them are especially worth coming over for. Their programmes are composted to serve a big audience of all age groups. The Night of Culture offers night crawlers a unique opportunity to absorb all kinds of culture in the nooks and crannies of Lublin. Performances take place in the most unexpected places and the doors of all cultural institutions are open until deep in the night. Some people will describe this night as one big open air party. During the Magicians’ Carnival, street performers and new circus artists will perform in Lublin Old Town. The cool thing is that workshops on all levels are available to attend as well. Urban Highline – the biggest slackline festival in the world – forms a part of the carnival. It is one of the leading new circus events in Europe. The Jagiellonian Fair dates back to the 15th century. Wealthy merchants were then ruling the town and many trade routes were in place. Craftsmen from mostly neighboring countries used to come over to produce and sell their handmade goods. The festival is hands-on, with many workshops available. The European Festival of Taste depicts again our history as a trading town. All kinds of people with different ethnicities started to call Lublin their home. Their cuisine is still available and proudly presented during the festival. The most amazing dishes and products from all over Europe can be sampled. Meanwhile, chefs and restaurants are battling to win culinary prices. 10 Reasons to visit Lublin – Martin’s City Tours insider tip: a handy online calendar is available to check what is happening during your stay in town. The former main road leading to Cracow and a one-time military parade ground – so much different nowadays. This partially car free shopping and leisure promenade leads you from Brama Krakowska (Cracow Gate) to the Saxony Garden (Ogród Saski). Krakowskie Przedmieście hosts many lovely local restaurants and bars. It is a great place to enjoy a meal and / or a drink on one of many terraces during the summer. Various food and cultural events take place here all year round. It is one of few places left in Lublin were you can still come across people queuing up in front of a store. Not out of shortage of goods like during the 80’s though. No, the citizens of Lublin are in love with the ice-cream made at an ice-cream parlor called Bosko. It is very common that you have to wait for your ice-cream in a queue on summer days. Plac Litewski (Lithuanian Square) underwent extensive renovations in 2017. The new multimedia fountains are a real eye-catcher, especially at night. Local kids love the water ornaments and use them as a free outdoor swimming pool in summer time. 10 Reasons to visit Lublin – Martin’s City Tours insider tip: if you like to act like a local, then arrange a meeting under the (new) black poplar referred to by the people of Lublin as “baobab tree”. Enthusiasts of architecture will confirm that Lublin Castle is a great example of a Neo-Gothic building. The current edifice dates back to 1826. Still, the history of Lublin Castle Hill is much longer. Mid-13th century, the first defensive keep was erected and next replaced by a Gothic castle in the 14th century. The Donjon and Chapel of the Holy Trinity within the castle date back to this time. The Chapel of the Holy Trinity is a unique building – a Gothic Catholic church decorated with Byzantine-Ruthenian polychromes. It is a true example of East meets West – a place definitely worth visiting. One of the most important events in the history of Poland took place in Lublin Castle. On the 1st July 1569, the Union of Lublin was signed creating the Polish–Lithuanian Commonwealth – a country 2,25 times bigger than current Poland, ruled by an elected king. Nowadays, the castle houses the Lublin Museum which offers a great collection of paintings, weaponry, coins, Polish decorative art and much more. 10 Reasons to visit Lublin – Martin’s City Tours insider tip: climb up the Donjon. It offers a great panoramic view of the Old Town and is an ideal location to take a few great pictures. A concealed green oasis situated in the city centre of Lublin. The history of this urban park dates back to 1837 when it was created. This hidden gem is an ideal place to relax in a peaceful surrounding when visiting Lublin. The park has about 12 hectares of land and offers quiet lanes to scroll around with enough benches to sit on and enjoy the unique atmosphere. Locals, young and old, use the garden in their leisure time. The Saxon Garden has the status of a historical and natural monument. 10 Reasons to visit Lublin – Martin’s City Tours insider tip: opposite of the main entrance to the park, on the other side of the street, you will find a small grocery store (entrance under the “Astoria” sign) that will bring you back in time to the communistic days. Although you can’t expect to be served in English, the prices are low and the elderly lady working there has a golden heart. The main entrance is located at Aleje Racławickie – a 10 minutes’ walk from Plac Litewski (Lithuanian Square). Please, walk down Krakowskie Przedmieście leaving the Krakow Gate at your back. After 800 meters, you will find the main entrance at your right hand side. Recommending a graveyard as a must-visit place during your stay in Lublin may sound a bit odd. However, once you have been there, you will fully understand why to place it on your to-do list. The cemetery at Lipowa Street is the 2nd oldest graveyard in Poland, opened in 1792. It consists of a Roman Catholic, an Orthodox, an Evangelical and a military section. The cemetery and the street it is located at are named after the numerous linden trees growing there in the past. Many gravestones are beautiful pieces of art, showing the highest level of sculptural artistry. Every year, fundraisings take place to collect enough money to restore and preserve some of the historical tombstones or grave monuments. Once you have seen the beauty of Lipowa, you will understand why the citizens of Lublin are so generous with their donations. Many graves are decorated with flowers and memory lights (candles). Relatives put lots of love and dedication in decorating and maintaining the graves of their loved ones. The cemetery is still in active use. Please, don’t be stunned if you come across a newly looking gravestone without a date of death. The owner of the grave is still among us. He or she is simply well prepared for the inevitable. There are not many empty graves left and the still available ones are in high demand. 10 Reasons to visit Lublin – Martin’s City Tours insider tip: visit Lipowa cemetery during the evening of All Saints’ Day (1st November). The graveyard will then be beautifully enlightened by thousands of memory lights. Act like a local and buy some memory lights yourself. Place them on graves with a low number or no lights at all. Please, double check if the grave is occupied before you put a memory light on it – see above. Bus stop: Lipowa – cmentarz. Picturesque, colorful, bubbling, charming, full of history… these are just a few ways to describe the Old Town of Lublin. Within the borders of the former city walls, you will find a medieval street plan offering small streets with the most beautiful facades. The former Market Square (in Polish called Rynek) shows amazing examples of the Lublin Renaissance architectural style. This thanks to the great fire of Lublin in 1575 when wealthy merchants were able to redesign the Rynek according to the latest architectural fashion. Nowadays, the Old Town offers a huge number of bars, hotels and restaurants. This was not always the case. The Old Town suffered serious war damage and it fell in neglect during the days of the People’s Republic of Poland. It used to be a no-go area. Today, it is always a great idea to visit the Old Town on the last Sunday of the month when a big flee market takes place there. Especially during the summer, high volumes of merchants offer their goods for sale – often antiquities and household goods. This gives you a great opportunity to find a bargain. 10 Reasons to visit Lublin – Martin’s City Tours insider tip: situated in the Old Town, Hotel Alter is the only 5 star hotel in Lublin. An amazing, luxurious spa is available there also for non-hotel guests. Lublin has yet another hidden gem. Our regional Open Air Museum is located on the outskirts of Lublin. It is a very popular leisure place among the locals. You are lucky if you find a parking spot nearby on a sunny day. The musuem offers more than 50 buildings originating from all regions of the Lublin Voivodeship (province / state) – all situated among gorgeous parks and gardens. Their collection of buildings is very wide, showing the cultural diversity of the voivodeship. You can enter picturesque, wooden farm houses, workshops, a mill but also a small town showing daily life in 1930. All buildings look as if they were still in use. When inside, you are almost expecting a knock on your shoulder followed by the question: “Excuse me, what are you doing in my house?”. Scattered amongst the historical buildings, farm animals are held. You are allowed to pet them, which makes it an ideal attraction to visit with young children. Demonstrations explaining what the daily life was like for the former owners of the buildings presented take often place. On top of that, traditional Polish food is served in the restaurant. Guided tours in English are available all year round. Please, make sure to call a few days in advance to make an arrangement. 10 Reasons to visit Lublin – Martin’s City Tours insider tip: among the buildings, there are two wooden churches: a Roman Catholic and an Orthodox one. Services still take place in both of them. They offer a unique setting to worship. Please, check the museum’s website or call them for the timetables. Please, do yourself a favour and leave your diet at home when visiting Lublin. The traditional Polish cuisine is rich in calories. The typical dish related to Lublin is called cebularz. It is a white dough flat bread topped with diced onion and poppy seed. Cebularz is also one of the few remnants of the rich Jewish culture which once flourished in Lublin. The locals are so proud of this dish that they have even dedicated a museum to it. You can buy a cebularz in every bakery in town. The variety of typical Polish dishes is enormous. Nonetheless, a few meals need to be mentioned by name. First of all pierogi – dumplings stuffed with all kinds of fillings, a.o. potatoes and white cheese (ruskie), mushrooms or sauerkraut and meat. Polish soups are definitely worth trying, too. The most famous ones are white and red borscht. The red one is made out of beetroot. It is not a clever move to eat it when wearing white clothes. If on the menu, definitely try the cucumbers soup, made out of brined pickles. And yes, we are eating a lot of meat in Poland, especially pork. All the same, try out the Polish salads, too. Every restaurant has its own recipes and they often taste amazingly. This paragraph will be concluded with some life saving information for when you are invited by the locals. Regarding offering food or drinks: a Polish person does not take no for an answer in the subject “food”. It is seen as very impolite not to offer you at least 5 times something to eat or drink. Especially elderly ladies are real feeders. 10 Reasons to visit Lublin – Martin’s City Tours insider tip: there is no better breakfast after a long night out with local beers and vodka than the cebularz breakfast roll at Trybunalska City Pub. It is an award winning vegetarian breakfast roll roasted with mushrooms, Amber cheese, tomato and egg. It is not hard to get to Lublin at all. You can visit us by car, coach, train or airplane. It is even possible to come over by bicycle or walking: your journey will then only take a bit longer. Nevertheless, we are a stop on the route to Santiago de Compostela – the trail starts in Moscow. It is easy to travel from Warsaw to Lublin by bus. There is a lot of competition and tickets prices are starting from 10 PLN. The journey will take 2.5 up to 3.5 hours. This heavily depends on the number of stops and traffic. 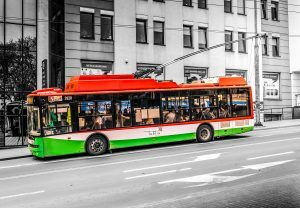 Frequently used bus companies are: Big Bus, FlixBus and Contbus. Contbus departs also form Warsaw Chopin (Lotnisko Okęcie) and Warsaw Modlin. Unfortunately, some websites are not available in English. Feel free to contact me if you need help. Planning your journey and buying your tickets goes the quickest online on the site of the Polish Railways (PKP). Warsaw The average traveling time to Lublin is 3.5 hours. Warsaw Chopin There is no train station at Chopin Airport. Please, take a taxi from the airport to the train station. Warsaw Modlin The average traveling time to Lublin is 4.5 hours (the station is called Modlin Lotnisko). A bus will bring you first from the airport to Modlin train station; the bus fee is included in your train ticket. The easiest way of traveling in Lublin itself is taking a (trolley)bus. “Jak dojade” is an amazing route planner tool. You simply enter your start point and destination and it tells you how long to walk to a bus stop, the name of the bus stop you need, how many stops it will take to reach your destination, etc. Another option is to use the site of MPK (bus service provider). 10 Reasons to visit Lublin – Martin’s City Tours insider tip: if you stay for a couple of days in Lublin, it can be nice to plan a day trip to Kazimierz Dolny, Zamość or Kozłówka Palace. Minibuses depart daily from the PKS bus station that is located on the opposite site of the road along the Lublin Castle.